Residents of Charleston have no time to argue about climate change; they are too busy dealing with the negative effects, including increases in tidal flooding—also known as "nuisance," flooding events that occur on sunny days with no wind. The city saw a record 50 high-tide floods last year, a sharp rise from the prior record of 38 in 2015, according to the National Oceanic and Atmospheric Administration. A half century ago, the city saw only two sunny-day floods a year. By 2045, given a moderate scenario for sea level rise, Charleston faces sea level rise of up to two and a half feet and up to 180 days of nuisance flooding—more than half the year. By mid century, a typical nuisance flooding event will affect at least 15 percent of the city. Tidal flooding has for years now affected individual lives and livelihoods in Charleston, not discriminating by class or race. Fouché Sheppard is a well-known resident of the city, a local Gullah poet and storyteller with a long history of activism against addiction and violence and advocacy for youth and seniors. Her awareness of sea level rise came in a most stark way, she says, when she was fired from her downtown job as an administrative assistant at a medical office. The reason? She could not drive around a nuisance flood. Charleston resident Fouché Sheppard lost her job as an administrative assistant when she could not drive around a sunny-day flood. Charleston is a city where the hard choices that sea level rise can force have already arrived. And, for now, the city is responding with major investments in defensive measures. For years, it has been planning ahead. It has spent more than a quarter of a million dollars on modernizing its drainage and sewage systems and pumping stations and working on bolstering its seawall. 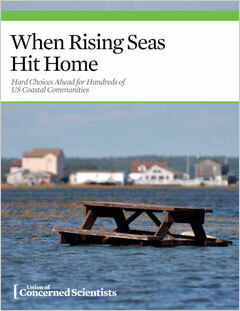 But defensive measures have their limitations, especially under pressure from rising seas. They can be overtopped or undermined by water that pushes up through the ground. They can hasten erosion and exacerbate flooding in neighboring areas. And they have an expiration date. Longer term, the city will need to bring creative solutions on line. The city has been thinking creatively since 2015 when, in an initiative launched by former mayor Joe Riley, the city announced its Sea Level Rise Strategy Plan. It includes scores of possibilities for future initiatives, including green infrastructure and bolstering wetlands, shorelines, and other natural absorbers of storm surge. It also calls for commonsense measures such as evaluating the environmental consequences of future coastal development. “We’re just at the start, but we’re hoping for an ‘all-hands-on-deck’ approach,” Williams said. Efforts to generate as many hands on deck as possible were evident this spring, in grassroots work by a leading community group representing diverse parts of Charleston. The group, Enough Pie (as in, “there is enough pie for everyone in this community”), staged a month-long series of events, from sea level rise presentations by scientists to massive public art displays, discussions by faith leaders, and performances by poets and rappers. Local events, such as this Enough Pie presentation in April 2017, are making the connection between climate change, melting land ice, and local flooding and arguing for equitable solutions for residents of all income levels. One evening, Enough Pie sponsored a talk by nationally known sea level researcher Rob Young of Western Carolina University. Speaking in a warehouse renovated into an art gallery, he made it clear that the situation is so serious he would give no city high praise for preparing for the floods to come. “At least in Charleston, they’re having an open discussion,” he said. “But the reality is that cities and states have to first adopt the physician’s pledge of ‘do no harm.’ But harm is still going on all around us. We’re still building high rises on the oceanfront in coastal communities. On the second floor of the gallery, people went from Young’s talk to take in a huge installation, in which large-screen photos of inundated cars and homes in the streets of Charleston played in a loop next to a stream of images of melting glaciers and ocean wildlife. “We’re trying to use all the creative resources we have to empower our community, not just to be aware of sea level rise, but also to make sure their voice is part of any solution,” said Enough Pie Executive Director Cathryn Zommer. One of those community voices, Fouché Sheppard, who greeted visitors to the art installation, wanted it to be clear that equity must be part of any solution. “You can’t have some neighborhoods getting where they need to get, and rich people being able to afford to build homes 14 feet off the ground, while others literally wade in the water,” she said. An hour and a half down the South Carolina coast, Beaufort Mayor Billy Keyserling talked about how creative he has to be to raise awareness of sea level rise. Two years ago, in his living room, he put together a sea level rise task force for Beaufort and neighboring Port Royal, with a wide range of members from business leaders to scientists and community residents. In May of this year, the task force released a report Keyserling hopes cuts into the denial. The report said chronic inundation from a three-foot rise in sea level would cause “great harm to the Beaufort economy” in its historic downtown, often called one of the prettiest in the United States. A two-foot rise would begin to inundate the county airport, and a three-foot rise would likely cut off access to the runway. UCS analysis shows that by 2060, a two-foot rise would cause parts of downtown Beaufort to flood, on average, every other week. And by 2080, a three-foot rise would entirely flood the county’s airport with that same frequency.